The idea of stuffing a computer inside of a desk isn’t entirely new as modders have been doing it for years. Unfortunately, most of us don’t possess the time or skill required to build something that’s both functional and aesthetically pleasing. Now, Lian Li has come to the rescue with a pair of cases that double as a desk, the DK-01X and DK-02X. Both are constructed of aluminum in true Lian Li fashion and support HTPX and smaller motherboard form factors. The DK-02X can also hold a secondary mini-ITX board alongside the primary system. You’ll find external USB 3.0 ports, HD audio ports, a slim optical drive slot, a power button and a lock across the front of the chassis just above the adjustable keyboard tray. A storage tray with hooks to hang headsets and the like can be positioned on either side of the desk. Users can access the chassis inside either by opening the drawer or removing the tempered glass top – the former would seem easier as you’d need to remove your monitor(s) to lift the glass off. The DK-01X supports up to 10 2.5-inch or 3.5-inch drives and comes with seven 120mm fans. There are removable dust filters all around and there’s even room for a 360mm radiator up front. An array of slots around the chassis aid in cooling and cable routing. To my knowledge, this is one of the first such implementations from a major manufacturer of enthusiast gear. It may not be as elaborate as some of the custom jobs we’ve seen over the years but it certainly looks practical and you can actually own one this July. Pricing is set at $989 for the DK-01X while the larger DK-02X will set you back $1,189. 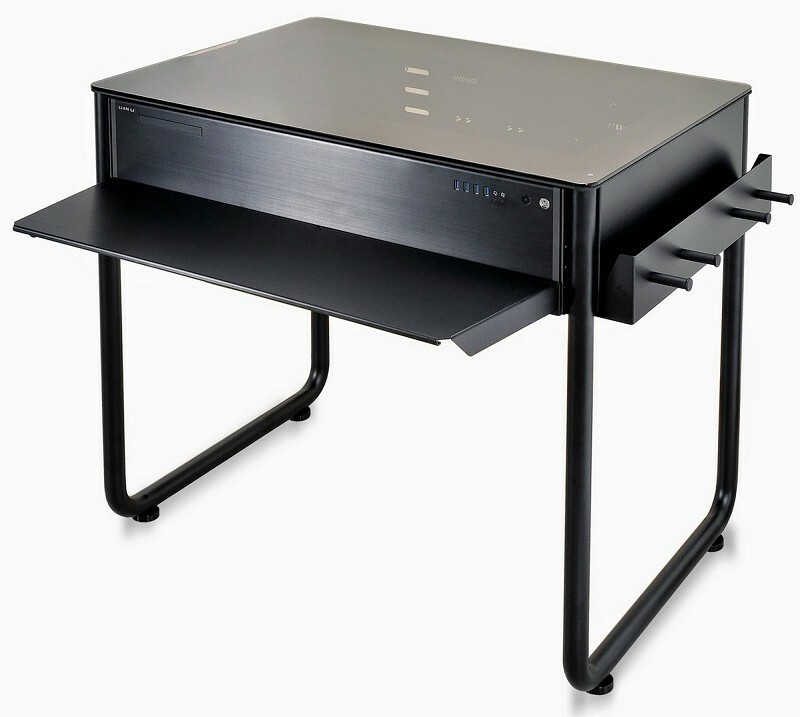 Yes, they’re expensive but you’re getting a premium chassis and a premium desk for the price.